Other Little bit of advice from some gurus? It’s time for me to get/build a new rig. I’ve been working with an ROG G750JM-ds71 for a hot minute now. I have a great insurance policy thru my renters insurance so I’m about to utilize that soon. Anyone notice any large bottlenecking issues with this build? Bottlenecking of what? What are you doing with it? That is a great build IMO. Moderate GoPro editing, intense gaming, and wrist breaking. I did want a little bit more bang in the monitor but the next one up was another hundred bucks without searching too hard. I wanted to keep it under 1500$ as well but that didn’t go too well lol. Use an NVMe M.2 SSD for your boot/OS drive rather than a SATA SSD. I suggest something bigger than 120GB too. I actually already have a TB SSD that I have partitioned (200gigs for my OS) and the rest a mixture of random oddities and another TB HDD partitioned a few ways for all my movies, most of my games and backups. But you can never have too much space so I’ll check that out for sure. The one I have in the cart right now was just for my OS, but I’ll have to check that link out. Ditch the sound card. Don't need them with modern motherboards. Change the liquid cooler to a noctua d15. Change the case out (personal opinion). Get a Samsung 250gb ssd, they can be had at best buy for cheap. I would recommend 32gb of ram over 16. You don't need a 850 watt psu, you can go with 650 or 750. I just got a system. I got a great deal on Newegg. $999 shipped no taxes. Here's the link, although not available anymore, you can see the specs. I liked the PC because ram and GPU prices are inflated. I went looking for the best possible CPU and MOBO combination in my price point. That is how I ended up with the i7-8700k and the z370ftw mobo. Both are just about the best you can buy without just wasting money. 8gb of RAM and the the 1060 6gb are sufficient for most things. This is the exact system I have ***EXCEPT*** the Samsung 970 Pro m.2 2280 NVME SSD and the 16GB of ddr4 2400 RAM. Those are my possible upgrades. I have been doing a little reading about if I can put 16gb of the exact same RAM with the existing 8GB since the price of 16GB is a better value and the 8GB. The system works very well. The optane lets my OS boot from a traditional HDD in about 9 seconds. However, many things run slower than I would like. Considering you are building the system from the base, I wouldn't go with the optane + HDD solution. Know that the Optane m.2 combined with the Samsung 970 eats up 4 of my 6 Sata lanes. Yes, 1 m.2 shuts down 2 sata lanes. RAM is sufficient for me but 16gb would be much nicer since you are DIY. Get 2x8 of something you know that you can later get 2 more of the exact same 2x8. I'm not sure of the true benefits of buying the faster Ram. From what I have read faster ram is the least of the performance/dollar investments. I think you are selling yourself short on that SSD. Yes it is a SSD but the SSD is limited by the Sata port. Also that is nothing in the way of memory. Modern games are about 80gb. You have enough SSD there for you OS and one game. I am not expert on computers but I believe you will be happier if you invest is a NVME SSD of 500gb. Yes your price will go up by $100 for something like the Samsung 970 EVO but it will likely be money well spent. I have Xbox One 1tb, and a 5tb external HDD. Crazy how fast modern games fill it up. I can post the sizes if you would like me too. I think games like GTA5, Battlefield 4, COD WW2, etc are about 80gb each. Xbox Play anywhere is something that I am going to be using my PC for. Forza Horizon 4 is going to look much better on my 3440x1440 100hz monitor than it will on my 65" 4K. I think it is very important to note that my system on Parts picker is $900 more than you system. My monitor is most of that cost, about $725 of it. You do have a set of speakers, keyboard and mouse, sound card and wifi adapter which I do not have so in total my system is about $900 more (I got much better prices than parts picker shows, I think I have $1500 in my system). You definitely do not need a sound card for a 2.1 sound system. Buy yourself a nice gaming headset. I use the Afterglow AG9+ ($80), but I'd like the Rig800 ($150). Also not sure why you'd use wifi on a desktop. Hardwire it with LAN if that is anyway possibly an option. The samsung 970 Evo 500gb is better and twice the size (although that other SSD is probably a lot cheaper than the inflated newegg price). For GoPro editing you should also look at the 970 pro which has substantially better write speeds. Look at the previous gen 960s to save some money. Here is a good deal like the one I got. 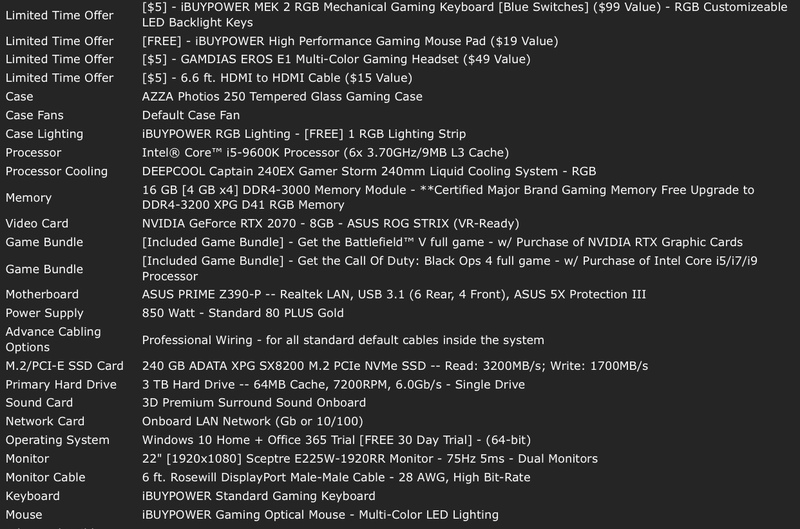 It does not have a video card, but it has more ram (and faster) and a ssd (hybrid drive) compared to mine, but is cheaper, and the card I have is about $300, so in the long run it might be an even better deal than what I got. Here's the full list of the 2-day sale. I personally think the one I linked is the best deal in the $1000 price range, as long as you don't mind buying the video card seperately. I’ve been reading everyone’s responses and greatly appreciate the guidance and help. Haven’t purchased a system yet because of life but I will post what I end up getting when life slows down just a wee bit. Should be ready by the 14th or sooner. My main battle was picking between the gtx1070ti 11gb or the RTX2070 strix 8 gig and I ended up choosing the RTX because I want to be prepared for the upcoming games. I saved 756USD on this entire build as well so I feel as though I didn’t do too shabby.